Sorry, vegans... and anyone else who abstains from the use of animal products in their diet, and/or rejects the commodity status of sentient animals: we ate, like, infinity burgers, and rounded up the very best in DC, from the most highbrow steakhouse-style burger (goodbye, $18, we hardly knew ye) to the casual grab-and-go burger (Shake Shack, you always satisfy). Whether you're looking for a thick, juicy round of beef grilled over an open fire, or a thin, griddled patty seared on a flattop, odds are that a restaurant in DC is making the Burger Of Your Dreams, right now. It makes sense that one of DC’s best steakhouses would have one of DC’s best burgers, and its Oak Fired Prime Steak Burger is certainly among them. The patty is made of high-quality, dry-aged beef that includes a blend of brisket, short rib, and chuck, freshly ground every day. Grilled over a wood fire, the beef is brushed with red wine butter that soaks into the patty, infusing it with a subtle sweetness. The seeded bun receives a similar treatment, getting brushed with a mustard-butter blend before being lightly grilled (the better to soak up those sweet, sweet meat juices). The whole shebang is then topped with Cabot clothbound white cheddar, red wine-braised shallots, lettuce, and Bourbon Steak’s proprietary Secret Sauce. Is it expensive? Hell yes, it’s expensive. Is it worth it? It’s worth it. There’s no way a DC burger list can omit the Proper Burger at Duke’s Grocery. It’s a monster: the double decker is piled high with two griddled patties (kept thin to maximize the char) and topped with smoky Gouda, charred red onions, a Thai sweet chili sauce, dill pickles, arugula, and a garlic aioli. A thin, buttery bun balances out the ingredients, and stays durable enough throughout, without disintegrating into a sodden mess. The real question you’ll face: should you add the chicken liver pate? A fried egg? Well… in for a penny, in for a pound, you know? Frank Ruta, the executive chef at Rosewood Washington, D.C., has a sterling resume: a former White House chef, he graduated second in his class at the American Culinary Federation’s Pittsburgh chapter, and has worked at a two-star Michelin restaurant in Merano, Italy. The closure of his restaurant Palena in 2014 sent ripples through the DC dining community, in large part due to the perfect burgers he was creating. Suffice to say, with a background and training like his, the dude can cook. 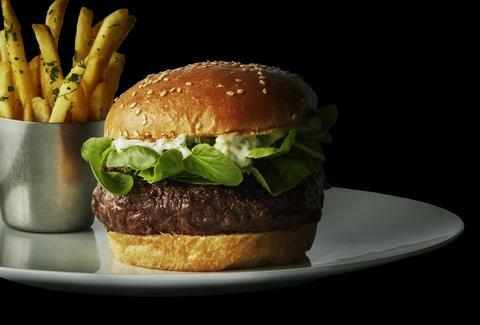 And what a burger he makes... the classic Grill Room Burger is an Angus beef patty made of dry-aged steak, topped with mayo and truffled cheese, and served on a house-made brioche roll. It’s so simple. It’s so delicious. Don’t you dare ask for ketchup. When we're looking to recreate a high-end version of the McDonald's Big Mac taste profile, we head to Red Apron’s shop in Union Market. It’s the only burger on the menu of a butcher shop, and for good reason. 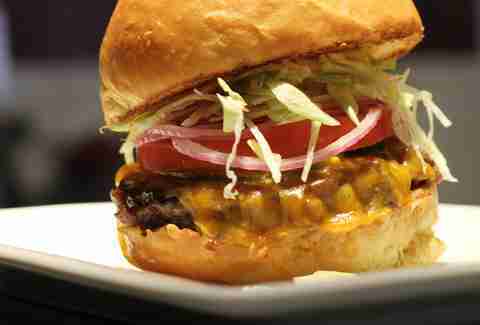 As you might imagine, it uses some the best beef (a blend of brisket, short rib, round, and sirloin) of any burger in DC. Shredded iceberg lettuce, bread & butter pickles, and Red Apron’s own "Island Sauce" give it the feel of an upscale Big Mac... but without, you know, all the disgusting hormones, mass-scale factory-farmed beef, and evil multinational conglomerate horseshit. So... win-win. People don’t often consider balance when evaluating a burger, and they should. The ingredients of a great burger need to be in the proper proportions to one another, each part complementing, and not overpowering, the other. That’s exactly what you get with chef Alex McCoy’s creations at his Lucky Buns burger pop-up: balance, thanks to the use of pristine ingredients. Take the Original Gangster: a Creekstone Farms beef patty, layered with Ilchester smoked cheddar and house-made pickles on a Lyon Bakery brioche bun. All are great ingredients elevated by the addition of a charred red onion (which adds a smoky bitterness that plays off the beef and cheese), arugula (which brings sharpness and zest to cut through the fats), and a house-made Thai chili and garlic mayonnaise. The Great Chicago Fire at The Big Board is a solid standby burger. The folks who run this place are great people, and they make an outstanding burger. It’s not grass-fed; it’s not organic; it’s not super-fancy. 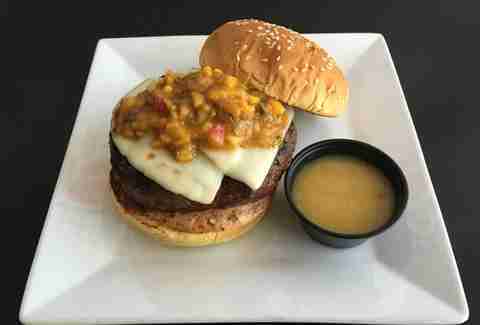 It’s just a damn good burger, made with hand-pattied local beef, dusted with chipotle powder, and topped with habanero jack cheese and a dollop of sweet & spicy mango-habanero salsa. We're not usually a fan of Jack cheeses on burgers (American just melts too perfectly not to use), but it works here: the chipotle gives the loosely packed beef a nice smokiness throughout, and the heat of the habanero keeps you going back in again and again for one more bite, just to alleviate the burn. Then you look down and it's gone. Sometimes a burger lover just wants to go decadent. 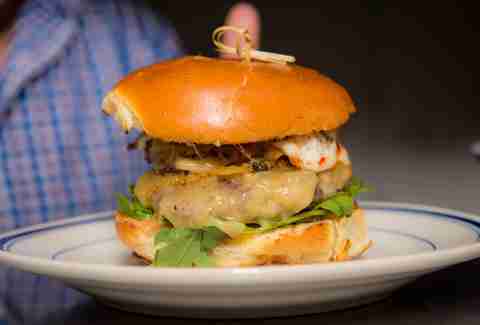 Look no further than chef Jonathan Dearden’s Rad Burger at the recently opened Radiator. The minerally tang of a good brisket/chuck/short rib blend, aged well and served medium-rare, mingles with the funk of cambozola, an oozy, triple-cream hybrid of camembert and gorgonzola; red onion marmalade adds even more umami. Add on a few of Radiator’s kimchi pickles for some acidity to cut through the richness, and this burger is ridiculous, a legit contender for one of the best in DC. Double down on the napkins for this one. You’ll need them. This is the classic by which we measure all other DC burgers. Thin patties of beef -- which are easier to char on a flat-top -- from noted purveyor Pat LaFrieda stay super-juicy, even with the great crust; classic American cheese melts perfectly over the top. The best part? A house-baked brioche bun that stays soft enough to bite through, yet maintains the structural durability necessary to contain all of the amazing flavors within. 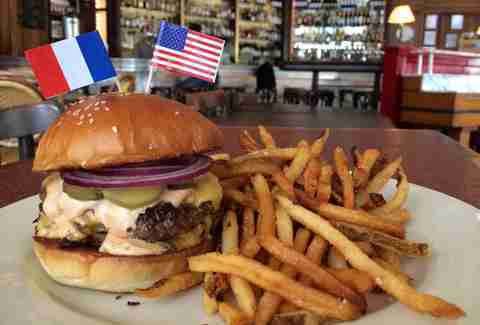 This is one of the strongest American-French partnerships since the Revolutionary War. Danny Meyer is a ridiculously successful restaurateur; this dude just knows how to pump out great product, whether in a dining room with white tablecloths, or out of a cart, with burgers served to you in wax paper. And man, is that classic ShackBurger something else. It sounds so simple: a Black Angus beef patty topped with American cheese, tomato, lettuce, and "Shack Sauce," served in a grilled potato bun. But the sum is so, so much greater than its parts. When we moved to DC from California, never in a million years did we think that a fast food burger could best the In-N-Out double double, Animal Style. We were wrong. This is burger perfection for $5. Logan Hollers is an environmental lawyer in DC who also contributes food and booze articles to Thrillist and BrightestYoungThings.com. His favorite burger, one grilled on his back deck with a beer in hand, didn't quite make the list. Follow @lhollers on Twitter and Instagram.